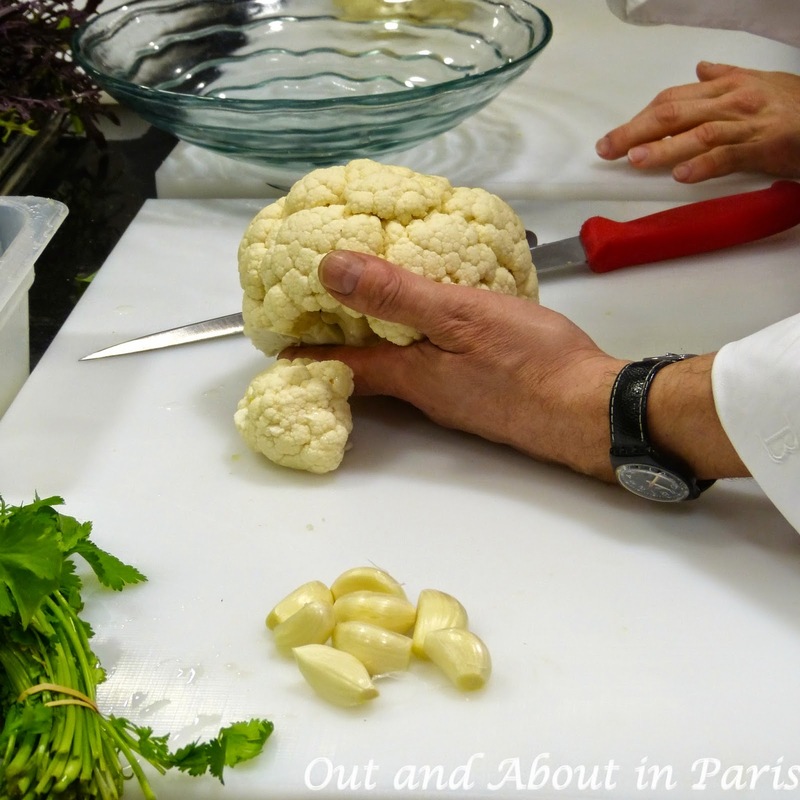 Cook like Le Cinq's Michelin-starred chef -- Eric Briffard's simple recipe for "Cauliflower Taboulé"
With summer fast approaching, I've been looking for some simple, healthy recipes that I can prepare in advance. Thanks to my recent market visit with George V's Michelin-starred Chef Eric Briffard, I know the perfect salad for our annual picnic at Château de Vaux le Vicomte and or our next dinner with friends. It's easy to make, very healthy and delicious, which is why Chef Briffard prepares it for his own family on a regular basis. Mix well and let the taboulé sit for at least 30 minutes prior to serving. *We used Corinthe raisins, but other raisins work just as well. Marinate them in olive oil, lemon juice, cloves, water and a teaspoon of sugar. But in these days, where new cuisine tends to be a melting pot of influences from around the world, my goal is to avoid confusion and impurity. I want my dishes to be clear and easy to understand. Some of the dishes on the restaurant Le Cinq's menu are directly inspired from our rich French culinary tradition, but lightly punctuated by emotions from "other places". That is my signature. Well, the recipe looked enticing until I saw "zucchini flowers," which I have never seen in 40 years of shopping at various American grocers -- both gourmet & regular. Zucchini flowers are a speciality of Italy. They aren't sold in grocery stores there either - it's a fruit and vegetable shop item, but most likely found in markets. Italians dip them (no zucchini, just the flower) in batter and deep fry them. In restaurants they first stuff them with mozzarella. They are exquisite. To make them in Australia I had to grow my own but I am sure the vegetable markets in Melbourne would offer them in bunches. Gwendoline in Ballarat, Australia. They're quite seasonal, and are easier to find at Farmer's Markets in the US than grocery stores, as they're pretty perishable. That said, when they're available, which is typically the first couple of weeks of squash season for a given type of squash, they tend to be all over the markets. Pretty readily available in the San Francisco Bay Area, but I'm sure many other places in the US as well.